We have two really interesting and very unusual restoration projects going on in unlikely locations. The Otto Franc homestead (on the Pitchfork Ranch) is in western Wyoming, not far from Cody, and the Hutmacher Farm is near Killdeer in western North Dakota. Both really caught me by surprise because I had no idea that any adobe ranch houses still existed in Wyoming, and I certainly had never heard of pitched mud roofs (no, not sod -- mud) in the upper Great Plains. But there they are, mavericks in every sense; separated from their "families," and unorthodox to be sure. These two projects, though geographically distant from the Southwest, have some amazing similarities to two other of our projects. 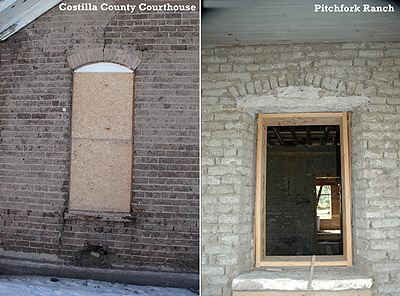 The first is the remarkable conjunction of masonry styles common to the Costilla County Courthouse in San Luis, Colorado and the Franc adobe in Wyoming. In both instances, the adobes were made onsite or nearby, and in both the size and proportions are more akin to the fired bricks one would find in the Midwestern United States during the same era, that being the 1850s through the 1880s. In both buildings the adobes were laid like fired bricks in what is referred to as Common Bond whereby multiple courses of stretchers (bricks laid long ways) are punctuated by a course of headers (those laid with the long axis across the wall). The clincher was the treatment of the windows and doors. In both Costilla County and the Franc house the walls above the openings were originally supported, not with wooden lintels, but with shallow adobe arches. In both cases, the design flaw later became a problem, but the point here is that it seems clear that masons familiar with brick were imported to construct, or at least provided the training for the builders of these two amazing, structures. I wonder. . . could they have been the same masons? Farther east, when I arrived at the Hutmacher Farm I simply had to stand in amazement and ponder the temerity of a family of German immigrants building a pitched mud roof over their stone walls on the climatically unfriendly plains. All they had to work with were cottonwood branches, some local brush, wheat straw and super-rich clay that I suspect is related to bentonite, which is used to seal bore holes in wells. The constant wind, the driving rains, the snow, the hail -- all conspired to assure that the roof be repaired and replaced constantly. The huge berm on the north side was not, I suspect, intentional though it did serve to insulate that frigid wall. By some standards the roof at Hutmacher Farm was a success in that it kept the family dry, mostly. I spoke with two of the daughters who grew up there (the place was built in 1928), and they noted that there had been a "maintenance issue" with the roof. By another standard, it would be considered an act of insanity to build something so audacious. But then, as I looked around, I saw no better solution resting incipiently in the natural resources at hand. When the wonder-strike began to wane, I got busy helping Preservation North Dakota (which now owns the farm) come up with a solution that will use the same basic materials but extend the maintenance cycle, which they currently cannot afford. The solution to the problem at Hutmacher Farm came, believe it or not, from Oraibi, the Hopi village in Arizona. Stay tuned to read how Maverick Mud was branded by the Moqui.